Will Realclimate survive until the year 2030? Risk 3.1 Stranded FF energy ‘stranded assets’ is a minor issue because they could all be made stranded from today progressively and the world could recover – the crunch will come when from ongoing “crises” the whole economic structures buckles under the strain of not having access to energy resources in order to keep running 24/7/365. When that 90% of the global economy gets “stressed” then a really serious risk evolves of ‘stranded assets’ across all sectors of business, agriculture, and industry. I agree with many of the views in this post but talking about the mental state of climate scientists is important both for the public and scientists themselves. A key difference between climate scientists who provide new evidence of major impacts from climate change and, to use the examples in this post, an epidemiologist who anticipates an epidemic outbreak or a meteorologist who predicts a storm or heatwave, is that, if the epidemiologist and meteorologist have strong evidence, they can expect to be taken seriously and action taken. That is usual for them but not for climate scientists. Climate change poses immense threats to the natural environment and society, yet the political and social response has largely been a collective shoulder shrug. Yes, the world has taken some action but nowhere near enough in the context of the dire impacts we expect. In what sane world would predictions from the leading scientific body that temperature increases of 1.5°C or 2°C will destroy coral reefs not lead to mass action to stop those impacts? But that’s exactly what the recent IPCC Special Report on Global Warming of 1.5°C says, yet the global community continues actions that will blow past even those levels. The authors of this reprinted post talk of “dispassionate management of climate risk” but that is not the world in which we live. If it was, we’d have taken much greater action a long time ago. A key challenge that climate scientists face is maintaining their personal mental health in the face of their evidence routinely being either ignored or downplayed. Depression is a normal emotion to feel. Recognising this and talking about it is important. POSTSCRIPT: I gave a keynote address to new researchers last year on the topic of “Building personal resilience for research on climate change”, where I spoke of the strategies I use to keep going (as an environmental lawyer working on climate litigation, where courts routinely downplay climate change). The deniers are part and parcel of the religious and conservative right. They are “know nothings” – or at least the educated establishment considers them as such. They are probably “know nothings” because they resent being considered so. That is, they can one-up the establishment by voting against it, and thus get an emotional victory. In all this mess, I don’t see the educated establishment, or at least the Democratic part it, giving up. They don’t seem disheartened. They are fighting on. The climate scientists are in the same boat. They should not be disheartened either. Sheldon @4, and what name would you prefer? “Ideologically motivated or self interested people who mostly use misleading rhetoric to downplay the IPCC findings on the climate issue?” Easier to shorten it to the word denier. Maybe not all people in blatant denail of climate science fit my description, but in my experince most do, and plenty of reseach has been published finding much the same. As an aside, the fossil fuel industry and the think tanks like the Heartland Institute were spreading lies, doubt, and confusion, and individuals were threatening climate scientists well before the use of the term “deniers” became commonplace. Most of the real nastiness is coming from the deniers, and so its up to them to change their behaviour, and the public to start demanding scientists are treated with respect. The fossil industry and the Pollution Profiteers are quick to point out their “stranded assets’ with respect to environmental restraints. What about the real-time “Stranded Assets” lost by “We the People” from droughts and higher food prices? Property value loss due to storms, floods, and forest fires? Poisoned water supplies because of Fracking? Lost fishing from Ocean Acidification? Health because of air pollution? Increased insurance premiums? Property loses to Rising Sea Levels? The list is long. In addition, Corporations are “people” now and as such they have a fiduciary responsibility to Planetary Life Support Systems, as do we all but most seldom internalize it. Then, of course, we must not forget billions of dollars of tax revenue lost subsidizing the potential Planetary ecocide inherent in fossil consumption. Poor Shelly, over on Dr Roys blog he blamed his calling climate scientists ‘alarmists’ is only bc he is called a denier. Its all their fault, not his, he’s blameless. And you surely don’t wanna hear what he calls Tamino. Shel is blameless for that too. No one denies ice ages. I think that scientists’ emotional (and behavioral) responses to the climate crisis are helpful and important to report on, for several reasons. 1) They provide a human narrative that people can not only relate to, but identify with. That’s why I tried to do exactly that in my ‘life and times’ series on early climate science: while the facts that John Tyndall worked incredibly hard to become a scientist, beginning work as a surveyor for the rapidly expanding British railroad network; that he was a notable mountaineer; or that he had a touching love-late-in-life romance with his wife, Louisa, do not directly illuminate his scientific work, they do place it in the context of a life that is fascinating in its own right. And in doing so, they make it much more emotionally accessible. 3) It’s evidence of the sincerity of scientists’ assessments of the significance of their work. I’ve often heard denialati argue that scientists and/or climate advocates are insincere–that they don’t live in accordance with what they allegedly preach to ‘the rest of us.’ (Usually the ‘evidence’ for this assessment is limited to citations of Al Gore’s Malibu house, Leonardo Dicaprio’s private jet, and maybe the fact that people fly to COPPs.) So it’s good to have evidence that climate scientists by and large live pretty normal lives–except that they integrate climate concerns into them in significant ways. An important part of that is the emotion: if you knew, deep in your bones, that climate change was going to make life harder for your child, wouldn’t you be sad? Of course you would. (Maybe you are!) But for those who don’t have that ‘deep in the bones’ knowledge, that sadness provides compelling evidence for the reality of the sadness, and therefore of the knowledge provoking it. All of which is not to say that every climate scientist needs to live in high-visibility mode, of course. But for those who are willing to share something of the personal effects of the knowledge they have, I think it a helpful thing, and I thank them. Given that doing so frequently attracts highly negative responses–such as abuse, harassment and threats–it’s pretty gutsy, too. Getting depressed wont keep the message out there – being right is not easy. But that’s what we are paid for -to tell the truth as we see it. it takes time for the message to be believed: And yes,if for no other reason that vast capital has been sunk into redundant industries. So vast resources will be spent to keep the old message alive. Just too easy in today’s Facebook world- false information.Today’s slogan/brand is jobs. For whom? The reaction time at present is very slow but accelerating. We really have to drop fossil fuels and get hydrogen out to all.I would suggest that the next half decent storm along with a good tidal surge that takes out a major city will push the rate of response up a gear. No body is scared enough yet and history records that strife is the great innovator. to what political era does he refer? Thought Reform and the Psychology of Totalism: A Study of “Brainwashing” in China. New York: Norton. 1961. Lifton’s term ‘totalism’ applies to styles of ideology that desire total control over human thought and behavior, but ( climate activists take note ) differs from totalitarianism in that it also apples to ideological groups that lack state power. Sheldon Walker’s contribution was extremely weak. +100 to Gavin’s reply. This may be true, but contains the roots of failure. Scientists are gravely mistaken if they believe H.Sapiens is primarily a rational species. A casual reading of the daily news reveals a marked deficit of reasoned intelligence; most important political decisions have deeper emotional and instinctive roots. There can be no ‘mobilization of collective intelligence’ as long as the political process is driven primarily by irrational emotion and knee-jerk instincts. Mobilizing democratic debate is similarly compromised. Effective democracy requires an informed, politically engaged public and transparent decision processes. By contrast, the publics in so-called democratic countries are increasingly ill- or deliberately mis-informed even when they abandon social media long enough to engage in the opaque morass of contemporary politics. Those in less democratic states never had a chance. In the circumstances, I cannot believe that the world community will succeed in making the economic structural changes necessary to reduce carbon emissions at 6% per year for the foreseeable future (particulary in the absence of adequate substitutes for fossil fuels–wind and solar don’t yet cut it). My finding and formula, that can be recommended, is that due to too high wear on the biosphere, (as can be seen by the need for alternative and fossile fuels for instance,…believed to be “not sustainable”,….) a lot of People reallize that some kind of a paradigmatic shift is necessary, and allready going on. My wiew and opinion is that a shift of paradigma is necessary for our wiew and opinions about energetics, and further of economy and lifestyle. Personally I am able to accept that. Thus I am not so deeply scared and frustrated by what Research on the climate tells us. But other People feel scared and deeply threatened by that quite inevitable paradigmatic shift, that has to come along in any case. Somehow, they seem to be brought up With and worshiping flames out of the exhaust tubes, in order to to keep up With the Jones and With the Kardasians. They cannot resign on that special lifestyle, because that threatens and ruins their very Identity, existance, and lifestyle. Thus, they go for an alternative shift of paradigma and fight quite bitterly for it. That formula can explain the Republican war on science. They obviously fight quite eagerly and bitterly for a very basic, general shift of paradigma in science. Alright is a word-in-the-making at least, and probably an independent word. “The climate scientists are all right” has a completely different meaning than “The climate scientists are alright”. Writing well is about creative and value-adding exceptions to the rules. Thank you, Gavin! I predict Mr. Walker will continue to deny climate science, however. Of course, I’d love to be proven wrong. It’s somewhat reassuring to learn there are fewer AGW-deniers in America now than at any time in the last ten years. Apparently some people can change their minds. AB: physical manifestations of climate change don’t affect too many well-off folks. Yep, I’d say your concern is evaporating even as we type. “all right” is ambiguous. In a fantasy debate individual climate scientists were matched with and debated individual deniers about each scientist’s specialty. Well, who was right? The scientists are all right (and the deniers are all wrong). Or it could be about subjects. Just how right are the scientists? Writer’s must consider the audience. Deniers seeing “The scientists are all right” may see an egotistical insult, especially if they have internalized the new(?) word “alright” (which is a perfectly acceptable spelling of “all right”). I think “all right” will die with the stodgy old Grammar Police. Of course, there will be another generation of Grammar Police who will have plenty of other things to feel superior about. To me, “all right” needs context. Titles have none and their purpose is to draw readers. Therefore, many of the best titles dance on edges. When one adds clarity and twists in a popular reference ya gotta cheer, eh? The other main issue of concern I have about this article is that it was written by Climate Scientists and not highly qualified Psychologists, Cognitive Scientists or Philosophers…. and a few expert Risk Analaysis folks for insights. People should stick to their area of expertise and not assume they have the answers for everything on the sole basis “it sounds right to them” where they sit. What they are REALLY speaking about above is the emotional roller coaster of HUMAN GRIEF. The author s MISS this fact, and by failing to label it correctly they have missed a real opportunity here to discover what’s really going on. They are ASSUMING XYZ is the cause of the problems they see when really it is the DENIAL of our emotional reactrions being triggered by non-stop GRIEF at what we collectively have done to this plaent and LIfe upon it, and the genuiens FEARS being triggered. It’s the authors who are in denial here while falsely “projecting” their own psychological misstep upon OTHERS out there. Tsk tsk. Grief is not a disorder. The ONLY cure for Grief is to Grieve! Understanding our emotional response and about appropriate responses. The basic premise of this talk is to tell the truth and ask us all to act accordingly and consistently with the information, including our understanding of what actually enables change to happen in the world. Furthermore, actually “managing risk” is not a part of our daily lives. WE have NO EXPERIENCE – let alone Daily experience – in handling thinking about or managing anything like the systemic RISKS of CC. None! You’re exaggerating this beyond reality. Most collective social risks is actually managed by Government Departments, by Law and Regulations. That’s why we have zebra crossing everywhere. The SYSTEM is setup to minimize unacceptable ricks FOR US. It’s the very same SYSTEM that brings us increasing GHG emissions today – because THE System has not go tot he point of effecting RISK MINIMIZATION regarding global warming yet. There is next to nothing any individual can do unless and until Governments Universally CHANGE THE WHOLE SYSTEM CAUSING AGW/CC COMPLETELY … root and branch, from bottom to top. Next to imagine or even attempt to remove feelings and expressing emotions is a fools errand. Not only can;t it be done it should not even be attempted. Science may be dispassionate but HUMAN PEOPLE ARE NOT – Scientists need to STOP DENYING this scientific fact and embrace the reality and stop pretending to has to be removed like a cancer from the discussions. All LAWS are based upon MORALITY – all Morality is internally based upon EMOTIONAL CONTENT and PERSONAL BELIEFS & VALUES. NO, no, no, no, no …… the management of climate risks MUST be extremely PASSIONATE or nothing will ever get done! People have to PASSIONATELY CARE about the Biosphere and our children’s Future above ALL OTHER DESIRES, NEEDS AND CONCERNS! THEY, YOU AND ME, EVERYONE, THE CLIMATE SCIENTISTS TOO MUST GET VERY EMOTIONAL ABOUT IT … PASSIONATE AND OBSESSIVE AND MORALISTIC … then the Laws will come to fix the SYSTEM by Reforming it root and branch. Why? Who says? Where’s your evidence? Where’s your proofs this is true and the right approach? Can you show me any Historical examples where this “suggestion” was 1) implemented and 2) actually worked? No one can overcome fatalism or indifference by being “cool, calm objective or dispassionate” nor by remaining in “scientific operation mode”. You gotta get HUMAN and EMOTIONAL first! And that has to be spread like a virus through society from one to another. NOAM: Well, we face a very serious dilemma. A stark, cruel dilemma. On the one hand there is a severe, dire crisis. Dealing with it cannot be delayed. It’s the most important issue that has arisen in human history. This generation – in fact today’s leaders and people – will make a decision as to whether organized human society can survive in any decent livable form. It’s no less than that. That’s one horn of the dilemma. The other horn of the dilemma is that we have to face the reality of the world. We have to find ways of reacting that are not only justified, but are also feasible and effective. No one’s gonna brought to the Hague. But recognizing that it would be legitimate and justified is an important way of helping the people comprehend the enormity of what is happening before their eyes. We should always bear in mind the slogan that Antonio Gramsci made famous: “We should have pessimism of the intellect, but optimism of the will.” It has never been more important than it is now. Climate scientists could do worse than to connect with people like these at the Sunrise Movement — YOU might just learn something REAL and PRACTICAL. So my case here depends partly on arguing that climate justice–which includes peace–is the master moral and political narrative of our times. But even more importantly, it depends on highlighting a potent newsmaking force for climate action–and latently for climate justice and peace–already on the ground: the Sunrise climate movement. Beware Dispassionate People — they are not fully wholly Human! Representing this short video lest it gets lost in the noise above. These two climate scientists GET IT RIGHT on the emotional toll of climate change. “So there are all these emotions that are almost unbidden when you learn about climate change and they’re really basal emotions. They’re like at the gut level fear anger shame, fearful of the future, fearful of the consequences, fearful that we can’t get this right. Shame, shame that I’m participating in this system that is degrading my son’s life in the future and the climate of the future. Shame that I can’t figure out how to buy a hybrid car right now and how to get off gasoline myself. Shame in my air-travel. “When people experience these massive scales of information what happens is they experience a cognitive break, a dissonance. “…and once she opened up then lots of hands, you know men and women flew up in the air, and we spent the next 20 minutes just listening to one another talk about how we’re feeling given the news of this. So they dissociated they literally cannot hear you Of course we respond like that because shame anger guilt fear. All of those things are some of them the most difficult emotions that we experience as people. We shun away from them. People who are grieving do not necessarily go through the stages in the same order or experience all of them. Please do stop denying and/or minimizing and dismissing your own emotions and those of others as somehow irrelevant or “less than” or as being a “problem getting in the way”. – persistent and exaggerated negative beliefs or expectations about oneself, others, or the world. – persistent, distorted blame of self or others about the cause or consequences of the traumatic events. With the exceptions of narcissists and psychopaths all Humans are Emotional Creatures. We are hard-wired emotional Beings. Don’t deny this scientific known proven reality – embrace it. If AGE / CC is going to be solved it is only going to be achieved by THE WILL WORDS AND ACTIONS OF REALLY PASSIONATE EMOTIONAL EMPATHETIC PEOPLE. To at least get somewhat closer to reality, it is nescessary to abandon the phrase “Paris agreement”. Because in this “agreement” in fact there is effectively no agreement whatsoever, except for the usual suspects willingness to portray their business as extremely usual = endless postponement of any effective policy to constrain global warming even just a tiny bit, as if it was really a very huge effort to break with business as usual. We at least has to end this orwellian practice. Unless we do so, we will just help those immensely powerful global oiligarchs like the Koch brothers and their likes, their paid politicians from Clinton and Obama to Trump, in short all the republicrats, the EUrocrats, the putinocrats, the House of Saud, etc. to continue into the climate collapse they are so eager aiming for and has been since the first time anyone mentioned anything about the problems with burning fossil fuels and coal etc. No worries, climate scientists. We should build as much wind and solar as possible so that we have an excess. Then it will make sense to build larger grids and invest in storage to even out intermittency. Piece of cake. How many have been “tested” to find out if they really are ‘alright’? Like we know already it is going to be hotter globally and regionally in 10 years from now than it was through 2018. Right? You can actually be scientifically certain about that. It’s going to be hotter in ten years from now than it was when all these fires ravaged Sweden, Norway, Greece and California in 2018. Right? We know that already. You can be certain of it. Why deny it and why be dismissive of anyone who tells such known truths. It’s not rocket science. I think all Climate scientists should be tested regularly for psychological affects as a normal part of their employment conditions and workplace safety requirements. Because one of the first things that arises as a Symptom from PTSD is ‘denial’ that you even have a problem. I kid you not. And there may even be additional layers of fun. Here is something worthwhile for the skyrocketeers to start bleating about. Carbon Brief have coverage of a paper Green et al (2019) ‘Large influence of soil moisture on long-term terrestrial carbon uptake.’ which finds that by 2060 (or before) under RCP8.5 the biological CO2 sink will globally begin to falter due to reduced terrestrial moisture & increasing temperature. I apologise if my response to #4 might have given anyone the impression that I have any interest in personally adjudicating any or all situations where people have been called climate deniers by other people wholly unconnected with me, RC or the authors of this post. It should have gone without saying but I had no interest in doing this then, I have no interest in doing this now, and it is extremely likely that in the future, I will still have no interest in doing this. Thanks! Promote binary and divisive visions? When’s the last time you guys promoted a moderate position. When’s the last time you were inclusive of Bjorn Lomborg, Michael Shellenberger, the Ecomodernist Manifesto, the Breakthrough Institute, …? So, let me get this straight–your idea of a moderate position is an average between truth and lies? #30. Hmm. Yeah, and Astronomy should stop being so snobbish and embrace astrology, evolutionary biology/creationism and NASA/ flat earthism, etc. They’re all equally valid! Er, no. There are multiple agreements. –Agreement on an ongoing process to implement all the foregoing. Paris isn’t perfect, but it’s the best thing we have going to date–far better than Kyoto. I think there are a lot of folks who apply the misguided notion that people are mostly motivated by fear. A few may be, but most of us are not, and especially in the relationships we choose to maintain. Provided they are not abusive, we stay in them much more because we think we are better off staying in them on the intrinsic rewards–not because we fear external penalties for leaving. What potential penalty could be applied to potential Paris defaulters that would be more aversive than the consequences of a failure to mitigate carbon emissions? Canman, it would be a real breakthrough if any of the above went beyond academic TED talks. They are by and large cheerleaders without a team on the field. When’s the last time you guys promoted a moderate position. When’s the last time you were inclusive of Bjorn Lomborg, Michael Shellenberger, the Ecomodernist Manifesto, the Breakthrough Institute, …? Probably the last time they said something in good faith. There is no reason to be inclusive to any hypotheses in science which deny obvious facts,recognized by almost all other scientists working on the subject in case. A good post. It is about psychology. But maybe the way we have been approaching it is backwards. Up till now it’s been, ‘If you want to avoid this awful negative, you’d better do this!’, which emphasizes the undesirable. Perhaps a better way would be to emphasize the positive. ‘If we can accomplish such-and-such, a beautiful and happy world will await us’. Kind of like an overly strict parent who yells at her bratty kid, “STOP IT, or you’re going to get you a beating you’ll never forget” vs “Johnny, help me with the dishes and then we’ll go out for a bike ride” (or make a cake, or what have you). Exactly! We need everyone, not just climate scientists, but every other scientific discipline to be impacted by CC discussing CC. Politicos, evangelicals, media, etc, in all nations, top to bottom, discussing it. By the same token, we need climate scientists discussing all of the other peripheral issues as well. Sky rocketing population growth. Mass extinction. Relentless habitat destruction and over-development. Deforestation. Mountaintop mining and removal. The cutting off of migration routes. Extreme hunting pressure. Ocean depletion. Vast areas of land, sea and air, now polluted almost beyond remediation with PCBs, oil, radiation and other toxins. The GPGP, etc. All legitimate sciences need to be on the same page and supporting each other. For too long it’s been like medical science where each area is so specialized that individually they are ignorant, and even uninterested, in what’s happening with the others. Perhaps that will require educating the educators. Ok then. Russell, thanks for the link to the Scott Adams video. Let’s hope the audience that needs to understand watches it. So I’d hope some of the climate scientists reach out to Scott Adams. Late in his video he lists the questions to which he doesn’t feel he knows good answers. Is it true that our current rate of temperature increase has precedent earlier in this century? Lindzen. Could be it’s not the rate — could be earlier in the century we had the same rate of rise but it didn’t last long. Can you really measure the temperature of the ocean in an average way? Do you think science can really get some kind of reading of the average temperature of an ocean? … I haven’t heard anyone who’s really close to how it’s done …. How do you measure the temperature millions of years ago to the level of precision that can be useful? I understand about tree rings, ice cores …. how accurate? which is the best proxy? Temperature adjustments — were they all in the same direction? heard most of the land ones were in one direction but most of the ocean ones were in the other direction. Doesn’t it only matter what the ocean is doing, shouldn’t we throw away all the land measurements? The belief is there are thousands of climate scientists … most of you would agree it’s the majority all on the same page. How many of them were actually part of the measurement gathering measuring things … gotta think it’s only a handful, maybe … 5 people who were close enough to all the good measuring methods. So “thousands of people trust 5 people?” “Chain of custody” for evidence, “does science have something like that …. and without that knowledge …. it sounds like they may have gotten all of the important information from …. 5 …. people who are close to the data. Two versions of reality — one is the claim that Michael Mann has data about temperature that he’s not showing anybody. “Most of the skeptics believe that’s true.” The other version is that he hasn’t disclosed how his model works. “But you can also look at the letter ….” Both of those can’t be true. Which story sounds normal and which sounds batshit crazy? I am a scientist with 42 years of very successful industrial research experience in the field of spectroscopy, the branch of science covering interactions between matter and electromagnetic radiation (ie: action of green house gases). I have one very simple question. The theory of AGW states that rising CO2 acts as a blanket reducing Earth’s energy loss to space (which it undoubtedly does) and that this CO2 induced reduction in outgoing long wave radiation is the dominant cause of Earth’s warming. How is this compatible with NCEP’s experimental data showing OLR has been rising not falling since 1950? Also the more recent NASA data showing the same thing. Yes I realise that as Earth warms OLR would rise but the claimed warming is <=1C and Earth's sensitivity is claimed to be 3 watts/sqM/C so even if there was no impact due to rising CO2 it would only explain a 3 watts/sqM rise yet the NCEP data shows far more than this. rising CO2 acts as a blanket reducing Earth’s energy loss to space (which it undoubtedly does) and that this CO2 induced reduction in outgoing long wave radiation is the dominant cause of Earth’s warming. I”m not the kind of expert Mr. Hammer says he is, but I think he got that wrong. Sounds like he thinks CO2 just somehow captures heat and turns it into middle age spread, so more CO2 would capture more energy and less would escape to space. CO2 re-emits energy in random directions; in the upper atmosphere roughly half would go “down” toward Earth’s atmosphere and roughly half would go “up” to outer space. So adding CO2 adds additional molecules to the upper atmosphere — which would increase both energy lost out to space and the energy returned back toward Earth. “Cheerleaders without a team on the field” – outstanding coinage, Russell (I looked it up) 8^D! IMHO you’re one of the smarter RC regulars, even if you are a deontological libertarian. Scott, if you take my suggestion, report back, and sound reasonable, I’ll be glad to watch your video, even though it will be mostly superseded by what you’ve found out from RealClimate. Carrie posts some good links and summaries of issues, but I take issue with this “Please do stop denying and/or minimizing and dismissing your own emotions and those of others as somehow irrelevant or “less than” or as being a “problem getting in the way”. The article just doesn’t do this , and neither do scientists I have listened to . The message I got was the article simply pointed out don’t let personal emotions and catastrophising overwhelm you, and lead to denial that the problem exists and / or can be confronted and solved. This is basic psychology anyway. It doesn’t mean emotions are being denied or seen as a ‘problem’, its more something we need to learn how to manage. Being ‘passionate’ about the problems, the science and mitigation is desirable I think, but seems like a different issue to me. Most scientists do seem passionate when speaking in public. I think some could be more passionate, and share their personal perspective more. Obviously its a fine line, because breaking down crying in public, or becoming very shouty would probably be counter productive. I’m a technical / design person and I don’t enjoy media interviews etc, but its something that has to be done in this day and age, and we need to put in 100% and be passionate and try to connect with people. I agree with Carrie that governments provide many of the frameworks to fix the climate issue but politicians obviously wont do much if they let their own feelings about climate change overwhelm them such that they go into denail of some sort. Gavin, thank you most sincerely for your reply. I note the graph you supplied shows an increase of about 2 watts/sqM in OLR. 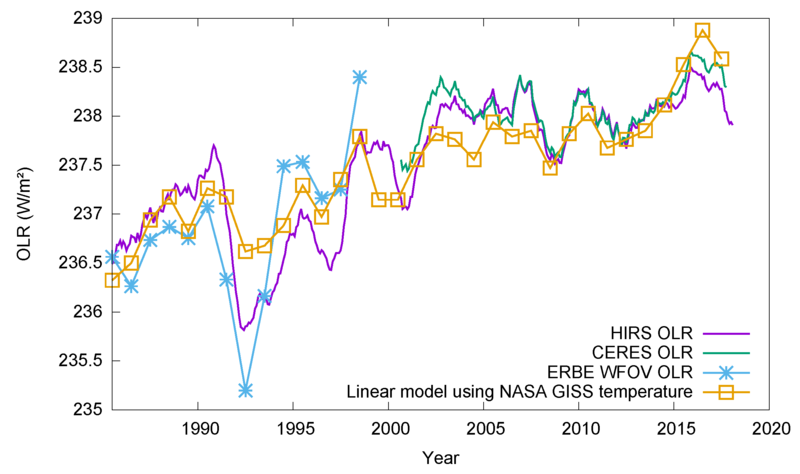 I checked a number of claimed temperature trend sites including NASA and Berkely Earth and the consensus seems to be about 0.4C rise between 1985 and now. So if the sensitivity of Earth is really 3 watts/sqM/C (it can’t be more than 5.4 since that is the black body sensitivity at 288K and GHG reduce that sensitivity which is of course why they cause warming) that would justify 1.2 watts/sqM which appears to be about 60% of the actual rise. OK the figures are inevitably a bit rubbery so maybe 2 watts/sqM is consistent. However that still leaves me with a problem. According to AGW the rising CO2 should be reducing OLR so the net change in OLR should be the rise due to rising temperature less the fall due to rising CO2. But according to the data you supplied, OLR seems to be rising as fast if not faster than predicted from rising temperature alone. That would imply no attenuation of OLR due to rising CO2. Yet we know GHG reduce energy loss. As CO2 conc increases one would expect the 14.7 micron absorption band to widen giving some reduction in OLR. Does this not mean there must be another mechanism at play and that mechanism must be at least similar in magnitude to the AGW effect? If OLR is simply rising to match the temperature then what is maintaining the energy imbalance that is causing earth to continue warming? Yep, the Zombie apacolypse is at hand. But strangely, the zombies do their damage by eating their own brains. While I do gather up and accept the dichotomy presented by the guest authors, I also well-understand how it is that powerful personal stories motivate us to care and act as few other things may. Presenting the stories that result from field work by researchers may be some of the better ways to motivate us. But only when infused with both the majesty and awe as well as the pain and loss felt by those researchers. Subtract that and you subtract the inside story itself, leaving only the lifeless husk. So I see the horns of a dilemma. Do field researchers just do years of field work, left only to summarize the distilled bits after they’ve satisfied themselves and others of what they can safely and securely prove? Or do they also present the fuller, larger, and vastly more vibrant story they’ve lived and felt? And who better to do so? A true story must come from those who have lived it to have any power. When the plane ride gets bumpy, I still study the faces of the flight attendants for signs of concern.